COLONIE – George H. Frisbee, 67, of Colonie, passed away on Wednesday, September 17, 2014 in the Hospice Inn at St. Peter’s Hospital with his family by his side. George was born in Albany, and lived in Albany and Colonie all his life. He served in the U.S. Navy Seabee Division during the Vietnam War, and served in Vietnam for nearly two years. He was employed for many years by Sonitrol. 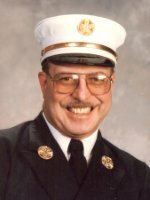 George devoted much of his life to service with the Fuller Road Fire Department. George joined the department in 1974, and served as President in 1980. He was named firefighter of the year in 1985, served as Chief in 1993 and 1994, and became a life member in 1999. George was a devoted fan of the New York Yankees, and enjoyed solving crossword puzzles. George will be remembered first and foremost as a devoted family man in addition to being known for his love for and devotion to his fire department. George is survived by his beloved wife Maureen A. O’Hanlon Frisbee; his children Scott Frisbee (Korrine), and Kimberly Wright (Michael) of Colonie; his brother Walter Frisbee (Rose) and sister Terry Litke (Dan) of Florida; his grandchildren Desiree Frisbee and Elizabeth Wright; his brothers-in-law and sisters-in-law Regina and Ed Nettleton, Kathleen Parker, Kevin O’Hanlon, Karen and Tony Groat, and Theresa and Robert Nichols; and by many extended family members and friends. Funeral services will be held in the Hans Funeral Home, 1088 Western Ave., Albany, Saturday morning at 8:00, and from there to the Church of St. Claire, 1947 Central Ave, Colonie at 9:00. Relatives and friends are invited, and may call at the funeral home Friday from 4-8 p.m. Interment with full departmental honors will be in Our Lady of Angels Cemetery, Colonie. In lieu of flowers, memorial contributions may be made to The FASNY Firemen’s Home, 125 Harry Howard Ave, Hudson, NY 12534; or the Capital City Rescue Mission, 259 South Pearl St, Albany, NY 12202; or Food Pantries for the Capital District, 32 Essex St, Albany, NY 12206. To leave a message of condolence for the family, or obtain directions to the funeral home, please visit www.HansFuneralHome.com. Click here to view George’s resting place in Our Lady of Angels Cemetery, Colonie, NY (zip code Albany, NY 12205). My thoughts are with my good friends Mike and Kim in their loss. I’ve never met George, but from the stories that Mike has shared with me, and the beautiful and caring wife/mother that Kim has become today, I can only imagine how wonderful a man George was. From my entire family, our condolences go out to the entire Frisbee family, all of George’s friends at the Fuller Road Fire Dept, and especially, Mike and Kim. Kim & family, I’m so sorry for your loss. Big hugs. Our thoughts and prayers are with you and your family. George was a very special person to us and to everyone that knew him. George always had a smile and he was great to be with and talk to. Ron will always miss his Friday nights at the firehouse with George. Our hearts and love go out to Maureen and her family. Sorry for your loss guys. May he fly with the angels. God bless your whole family. Maureen, I was deeply saddened when my cousin Joanie sent me a message yesterday with the attachment. Although I never had an opportunity to meet your husband, the video I just viewed shows just what a beautiful family you have and what a loving man he was. I still remember your wonderful son Scotty….shoveling my parents driveway, just minutes after my Dad passed. I pray you find the strength to get you thru these terrible days…and also the days to follow. Your children & grandchildren are beautiful. Maureen, Mary Ann and I wanted to let you know how sorry we are to hear of your loss of George. We have been thinking about you and wish the best for you and your family in the days ahead. I am very sorry for the your loss. My prayers and thoughts are with you and your family.